The theme park may be closed but there's still plenty going on at Alton Towers. 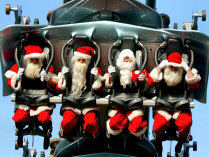 A week-long event called Santa's Sleepovers is being held at the Alton Towers Hotel and Splash Landings Hotel. There are also dodgems in the hotel grounds that guests can use at no extra cost. Festive entertainment comes in the form of the Cirque Noël Christmas Show, as well as the usual entertainment on offer. A "feast of delicious winter fayre" is also promised, for those partial to a mince pie or three. And of course, the children can meet Father Christmas in his Grotto. Guests will also be able to go on a guided tour of the Towers, and get an insight into Alton Towers' fascinating history. If you're interested in staying at the hotel for this event, you can also get money off if you stay on the 18th, 19th or 20th December, by quoting 'XMAS' when you book.